The wife of Nigerian President, Aisha Buhari has reportedly stopped the national chairman of All Progressive Congress, Adams Oshiomhole from entering Aso Rock. AlexReports gathered that Aisha Buhari is unhappy with Oshiomhole. AlexReports learnt that Mrs. Buhari reportedly stopped Oshiomhole from accessing President Muhammadu Buhari's residence in Aso Rock. She was alleged to have insisted that if the APC national chairman needed to see the president, he should meet him in his office. 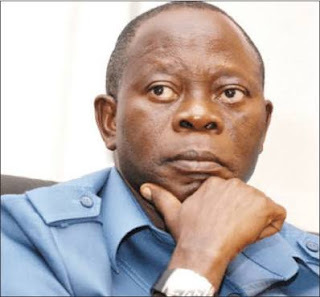 The president's wife is said to be disgusted over Oshiomhole's alleged mismanagement of the APC and she is said to be part of a plan by close aides of the president and some governors within the ruling party to remove him. She is said to have passed an order to the president's security personnel not to allow Oshiomhole come within the presidential residence. The First Lady is said to irked over her brother, Mahmud Halilu Ahmed's inability to clinch Adamawa state's governorship ticket.